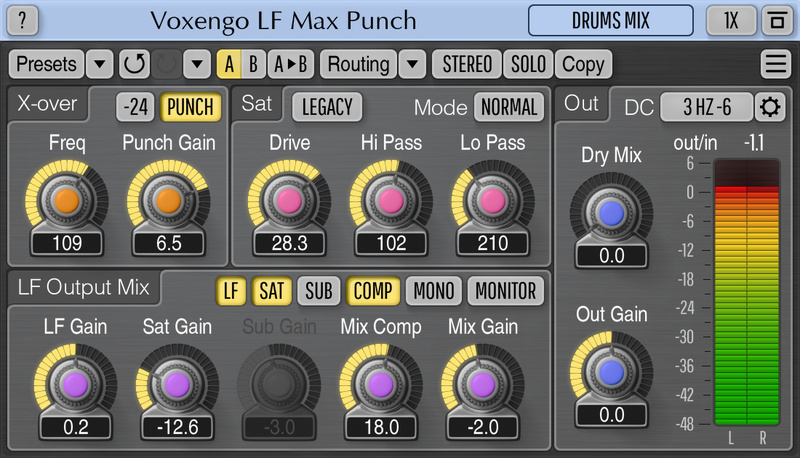 Voxengo LF Max Punch is a professional audio effect AAX, AudioUnit and VST plugin for music and sounds where low-frequency thump and punch are most welcome, and where distortion is applied specifically to bring the bass sound to life. LF Max Punch provides a low-frequency effect specially designed for serious contemporary music producers offering them a convenient tool for applying a smooth punch and oomph to audio tracks and sounds. LF Max Punch plugin dynamically emphasizes selected bass frequency band, applies a smooth saturation over it, and produces additional sub-harmonic content, with the ability to blend it with the original bass band sound. Optional compression can then be applied to the resulting low-frequency sound. LF Max Punch first splits the broad-band signal into low- and high-frequency bands and then applies the aforementioned effects to the lower band only.